Thank you to everyone who checked out and reviewed last week’s Shamless Promotion of Some of it is Muscle by Zachary Kluckman. 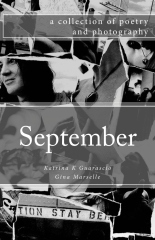 This week, SwEP will be shamelessing promoting the work of Katrina K Guarascio and Gina Marselle in their collection of poetry and photography entitled September: traces of letting go. There are two editions of this book currently available via Amazon.com, or for those of you in the Albuquerque are you can pick up a copy of September at Bookworks Albquerque and support not only a small press but a local independent bookstore. Special pricing is available via Amazon and Createspace. Katrina K Guarascio is a personal favorite. This collection of hers is something I am extremely proud to own. The addition of Gina Marselle, and her photography, makes for a well balanced book,and a nice assortment of emotions. I would recommend this to anyone in love with words, because the context in which Guarascio sets hers is unlike the majority of poets I’ve experienced. This is definitely a positive thing, too. It shipped without any complications, very quickly, and arrived in perfect condition. September is a book in three parts, three phases of letting go. The majority of poems in this collection speak to fleeting moments, a restlessness in the character, a yearning for something – more realized in exquisite experience of the current moment. The words cascade down the pages in short, clean lines making effective use of crisp white space that many poets underutilized. In this effect, I feel a sense of impermanence, like snapshots taken in temporary bivouacs on a road trip through young adulthood. The never-ending summer. The last days of youth. There is sadness, insight, worry, and relief sprinkled throughout this collection. Ruminating on love amid campfire smoke or the morning breeze on clean sheets, I am able to feel the conflicts and contemplations. In “Impermanence” Guarascio expertly describes internalizing the past and what it means to not let go when she writes “Like a sunburn, I know you will absorb into me and fade into memory. You cut me under the skin.” September is full of vivid images like this that develop into a cohesive flickering film of transition. The poet is ever seeking sense out of hardships, patterns in roadkill. The photography that accompanies this collection is superb. Images are well paired with poems. The many super close-ups speak of parts, the shapes of the body, and match the introspection of the poems. Gina Marselle has a great eye for emotion and her work is a well chosen accent to the book. Both Guarascio and Marselle are teachers in New Mexico. It is something to appreciate to discover your children’s lives are being enriched by the likes of strong artists as these women. September is a strong collection. It’s like a dreamy short film shot on 38MM with a soothing shoegaze soundtrack playing in the background. If you were to make your crush a poetry mix-tape, Guarascio would be on it – twice. Wake me up when September ends. Guarascio is an active member in the poetry slam scene in Albuquerque. She is responsible for establishing a poetry and spoken word community in Rio Rancho and coaching a youth poetry slam team. She is the founder of Swimming with Elephants Publications which is bringing the talents of many exceptional spoken word poets to print. Order September: traces of letting go from Amazon or Createspace. Guarascio gently weaves together simply written stories of love and release with consistency of the changing of seasons. Each poem is a delicate and welcome punch to the senses and as addictive as pomegranate seeds. Every word is full of intent and as precious as a ruby-red jewel. The bittersweet emotion infused into each poem is refreshing to the eyes. Guarascio stands out among the multitude of verbose poets; simplicity is her tool and she is a master of page craft. These poems are without flaw and each piece reflects the assurance that through love and loss, life will blossom. This collection is for anyone who wishes to see the softer side of letting go, coping with loss, and moving on. Katrina K Guarascio is an active member of the poetry community as a writer and a teacher. Guarascio also sponsors the Rio Rancho Youth Poetry Community and coach two youth slam teams. 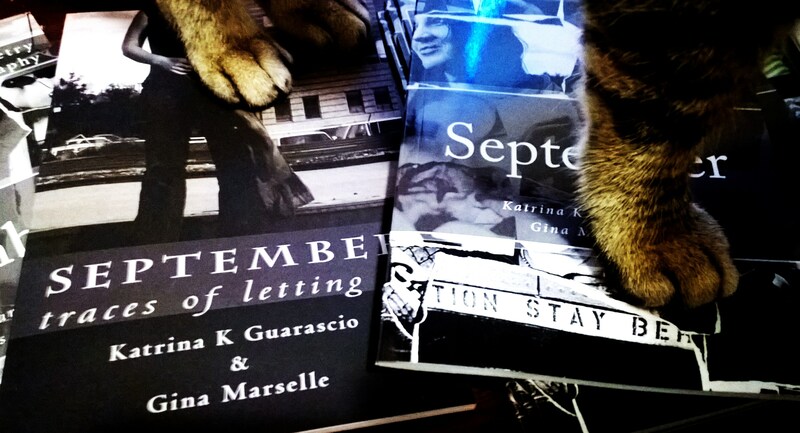 Her collection, September: traces of letting go, is a lovely compilation of photography and poetry. Find your copy at Amazon or CreateSpace.